by Charles Dickens Author · Matthew Pearl Author of introduction, etc. Central to the plot is John Jasper: in public he is a man of integrity and benevolence; in private he is an opium addict. And while seeming to smile on the engagement of his nephew, Edwin Drood, he is, in fact, consumed by jealousy, driven to terrify the boy's fiancée and to plot the murder of Edwin himself. As in many of Dickens's greatest novels, the gulf between appearance and reality drives the action. Set in the seemingly innocuous cathedral town of Cloisterham, the story rapidly darkens with a sense of impending evil. 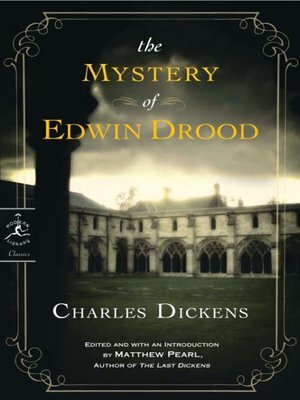 Though The Mystery of Edwin Drood is one of its author's darkest books, it also bustles with a vast roster of memorable–and delightfully named–minor characters: Mrs. Billikins, the landlady; the foolish Mr. Sapsea; the domineering philanthropist, Mr. Honeythunder; and the mysterious Datchery. Several attempts have been made over the years to complete the novel and solve the mystery, but even in its unfinished state it is a gripping and haunting masterpiece.